“Life is short,” Izawa Sensei shared as we took a break between the kyu tests and the four Nidan tests that were to follow. Yesterday was our biannual test day with our community of dojos including Izawa Sensei’s Tanshinjuku dojo and Albright Sensei’s Doushinjuku dojo. Combined, 15 students tested from the three dojos. 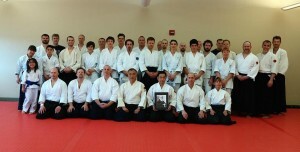 We had three students from Kiryu Aikido testing: Bob-san for Ikkyu, Greg-san for Sankyu, and Dave-san for Gokyu. Les-san and I were proud of each student’s test, which were strong and solid, and great examples of the hard work they put in over the last several weeks preparing for their tests. I also want to thank Charles-san for being Bob-san’s Uke, and all the students at Kiryu Aikido for helping each other prepare and for supporting each other’s Aikido path. I believe that preparing a student for a test takes a village – the dojo – and the students and instructors are all involved in various ways. For me, what Izawa Sensei shared resonated at this level: that we are what we practice, whether on the mat or in life (and in the end, it’s the same thing, in my humble opinion). The attention we bring to the details, the awareness we bring to the practice and the work, the presence and confidence we project as we move through the world…all are expressed in our way of being and result from how we practice. That energy then extends into every piece of our lives and becomes who we are. Thank you to Andrew Blevins Sensei, for your continued teaching and sharing Kiryu spirit, and Izawa Sensei and the students of Tanshinjuku dojo for again hosting the test and for your welcoming spirit, and for the camaraderie our three dojos share. I look forward to getting back on the mat, bowing into practice, and taking the next steps on this journey with our wonderful students at Kiryu Aikido.